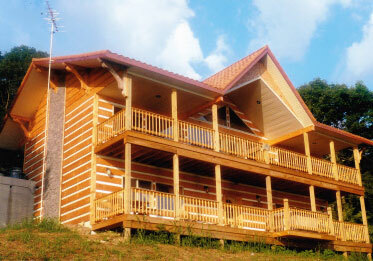 The “Moondance” & “Yin-Yang” cabins share the same size & floor plan. Both sleep six comfortably. “Yin-Yang” has no stairs to the 1st floor, The “Moondance” has 3 steps to the 1st floor. The 1st floor of both cabins has a full kitchen, Dining room table that seats 6, one bedroom with a queen sized bed, full shower bath with washer & dryer. The living room has a queen sleeper sofa & TV with DVD player. Your front & side doors walk out to your covered porch, with your gas grill & Hot Tub, just 2 steps away. Your campfire & wood / charcoal grill is outside to your riverside yard. Upstairs to the loft has an open railing with an Incredible River view. In loft bedroom, a queen sized bed with a full bath complete this Wonderful pair of “Twin” cabins. They each have an Incredible up River & down River view, your own ‘lil slice of Heaven on the River’s edge, in the Hoosier National Forest. Your view over the River is to the East, watching Gorgeous Sun & Moon rises! A full Moon night, the entire River transforms to ‘Moon River’,…it’ll knock your socks off. WEEKDAYS: Monday – Thursday $205.00 per night for the 1st two people. Additional guests are $13.00 each, per night. WEEKENDS: Friday – Sunday $215.00 per night for the 1st two people. Additional guests are $13.00 each, per night. MAJOR HOLIDAYS: $230.00 per night for the 1st two people. Additional guests are $16.00 each, per night. THERE IS A 3 NIGHT MINIMUM ON HOLIDAYS. THERE IS A 4 PERSON MINIMUM ON HOLIDAYS. 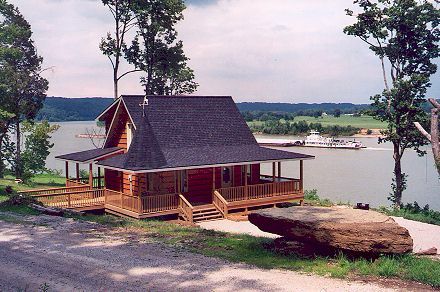 Our twin cabins, the “Moondance” and “Yin-Yang” boast twin spires with handmade weathervanes. Peace & Love live here. WW II Navy LST Ship No. 325 passing by the “Moondance” in July of 2003. Our mighty Ohio River is a navigable artery for some mighty big vessels. view of the Ohio River. The kitchen of the “Moondance” is fully equipped with all the large and small appliances, along with copper bottomed “Revere Ware” pots and pans, new dishes, plates and glasses. General Jackson visits the “Moondance” cabin.